Mortgage Lifter tomatoes were developed by and auto mechanic in the 1930s-40s. MC “Radiator Charlie” Byles cross-bred four of the largest varieties of tomato that he could find. He sold the resulting breed for $1 per plant, which was a lot in those days, but managed to sell so many that he was able to pay off the mortgage on his house. The meaty fruit of Mortgage Lifter can weigh 4lbs. The plants are fairly disease resistant and are a good producer. Slice these pink beauties for your favorite BLT or chop them up in a salad. Outstanding Features: Good resistance to Fusarium Wilt, Verticillium Wilt and Root Nematodes. Tips: Tomatoes will grow in any good garden soil that is properly drained. Good drainage is necessary to prevent “blossom-end rot”. The ground should be tilled deeply before the tomatoes are planted. The soil should also be enriched with compost, leaf mold, peat moss or commercial humus. Manure can be used, if at all, with caution. Set plants out after danger from frost has passed and plant them a bit deeper than what they were growing in their containers. If your plants are a bit spindly, plant them on their sides and cover with dirt up to their first leaves. Roots will grow along the buried stem and produce sturdier plants. To avoid wilts and other serious problems, rotate tomatoes and other related vegetables (peppers, tomatoes, eggplants) with non-related vegetables such as legumes and cucurbits (squash, cucumbers). Check out plant tags to see what a tomato variety is resistant to. Look for the designations V (resists verticillium wilt), F or FF (fusarium wilt), N (nematodes), T (tobacco mosaic virus) and A (alternaria). In addition, look for number of days until harvest (DTH) and the terms determinate and indeterminate. Determinate types (D) grow to a certain height and stop. Indeterminate types (I) continue to grow and bear fruit over a longer period of time. 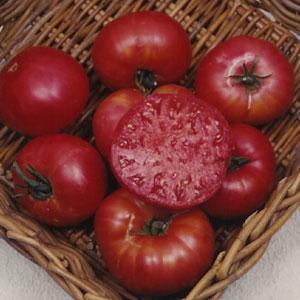 Click here to buy Mortgage Lifter Tomatoes direct from www.buygardenvegetables.com.